Happy thirty-first birthday, Liberal Democrats? Liberalism is desperately needed today. Liberal Democrats are sometimes powerful voices, but sometimes tongue-tied. If our MPs would even pick six such words and sound like they meant them, that would be a start. Our Leadership seems to think ‘Why can’t we all get along?’ is good enough. It isn’t. It’s a cry of helplessness, and they have no answer to their own question. It’s a cliché to say a Liberal won’t take their own side in an argument, but even after years of singularly failing to put any passion into Liberalism I didn’t expect our own Leadership’s answer to ‘Demand a better Centre Party’ to be ‘Oh, perhaps they have a point’. After a year of navel-gazing about ‘Registered Supporters’, now our Leadership doesn’t even seem to have the energy to ask potential supporters to register with this party in particular. Rather than assuming people would rally if we tinkered with the mechanics, perhaps the Liberal Democrats should have considered that the way to get people to support us is to articulate something worth supporting. Some time ago, I wrote about “What It Means To Be A Liberal Democrat”. I made the case for the values I believe in and the positive difference Liberal Democrats should make. Liberal Democrats can certainly demand better than what I publish here. But first we need our Leadership to stop standing frozen in the headlights in the middle of the road. To go anywhere, we must set out a direction of travel. To be a Liberal Democrat is to believe in freedom. Freedom grounded in real life, starting with people as they are. Not ‘The People’. Not ‘Our People’. Freedom based on the unique worth and potential of every individual person, and the reality that the person who knows best how to live their life is themselves. To be a Liberal Democrat is to demand better. Government shouldn’t just protect the interests of those who are already well-off, and sneer at and push down people working hard to make a life for themselves, or those who aren’t able to support themselves. Liberal Democrats demand freedom from poverty. Government shouldn’t assume it can do everything, control everyone, as long as you take what you’re given and don’t ask awkward questions of those in charge. Liberal Democrats demand freedom from ignorance. Government shouldn’t tell you that your nation is the only thing that matters about you, drive out ‘outsiders’ and call anyone who doesn’t want their flag cut smaller, narrower and meaner ‘traitors’. Liberal Democrats demand freedom from conformity. Liberal Democrats feel in our guts that everyone should be free to live their own life, that pushing people about and telling them what to do or who to be is wrong. We feel in our guts that everyone should have a fair chance, that prejudice and lack of opportunity are wrong. We feel in our guts the need for a better future, that piling up today’s problems for our kids to deal with tomorrow is wrong. But politics isn’t just about gut feelings and protesting when things aren’t right. We must face up to how things really are to work out how to change them, and change our own methods if experience shows us better ways to achieve our ideals. So Liberal Democrats are principle-led, but evidence-based. An open, fairer society and a greener, stronger economy are interdependent. 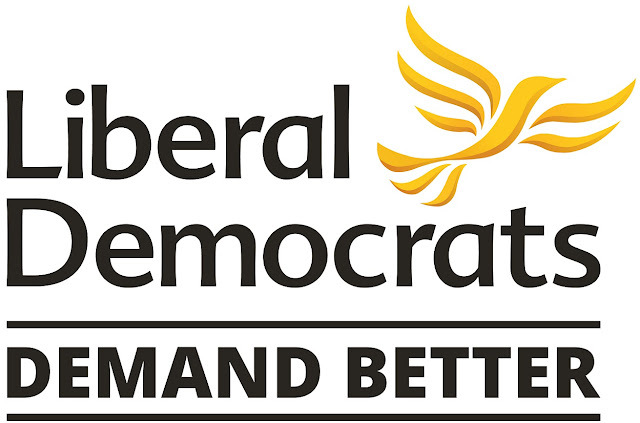 Liberal Democrats champion opportunity, fairness and economic responsibility. An economy that works, that encourages enterprise, that’s environmentally and financially sustainable, and where everyone pays their fair share. All thriving within an outward-looking, optimistic society that’s open-minded, open-hearted and open to co-operating with other countries to tackle climate change, promote peace and increase prosperity for our whole planet’s future. Liberal Democrats believe freedom needs both positive help to make it real for everyone, and action to break down barriers to freedom such as poverty, ignorance and conformity. Education is the single most crucial way to combine both. A great education ensures everyone has the opportunity to realise their potential, whatever their background, whatever their choices. Every child getting the best education is central to them growing up with the freedom to live their own lives, getting a fair start and building for the future. If you’re for every person, and you want every person to have the ability to ask the important questions and make their own informed decisions in realising their own dreams, education is where it starts. If you want an economy growing and succeeding with innovation and creativity and where the most talented get ahead instead of just the most wealthy, education, training and apprenticeships are where it starts. 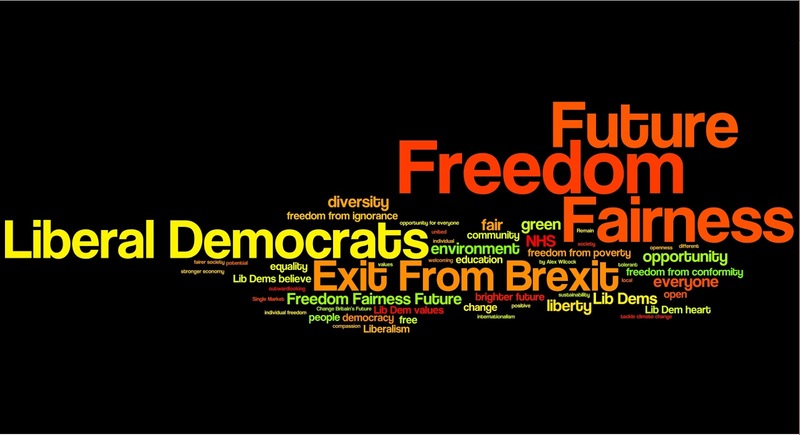 From the foundation that society should be for everyone and that everyone should be free, Liberal Democrats understand that individual people choose to come together in any number of complementary ways – families, jobs, mutual interests, neighbourhoods, nations, the whole human family – and that decisions can be made at any of those levels without giving up the others. That’s why we’ve always been both the most localist and the most internationalist party. Any political party denying diversity, defining itself by just one single identity or community and telling each individual that your birth or your faith or your cash or your class or your country is the only thing that counts doesn’t just diminish people’s lives and hopes, doesn’t just make society more fearful, hateful and divided, but is the mark of a party so stuck in its own prejudices that it has no idea how real people’s real lives work. One vivid, simple answer to what Liberalism is for has always stuck with me: Liberalism is about standing up to bullies. That’s why a Liberal’s gut instinct is to side with the underdog – whoever the bully is and whoever the underdog is at any one time. Any sort of power can threaten liberty, but any sort of power can defend it, too. Whether it’s the state, or big business or big unions, or just other people, any of them can boss you around and anyone can help stop you being bossed around. So Liberals wouldn’t label any of them ‘the enemy’ or do away with any of them – just as we won’t say any of them are right all the time. When government acts fairly it can be the biggest force to restrain bullies, from crooks and murderers to stifling communities and bad employers; but a government that bosses you around or that only protects one special interest or only picks on another is just a bigger bully. The closer anyone has to a monopoly of power, the more it’s abused. Liberals challenge power and privilege, break up monopolies, set the same rules for everyone and make the starting point for any decisions the people that they affect. When the starting point is people, what’s the end point? Get real! If you start with people you never say ‘that’s it.’ Whether it’s a grandiose utopia that you’ll never finish building or a thousand mean little targets to tick, imaginary end points have two things in common. Believing the ‘ends’ justify the means, they throw real people under the bus, seeing individuals only as statistics or as problems. And they never work. A Liberal society isn’t a perfect society, because there aren’t any perfect people or perfect politicians – but an open, untidy society that develops constantly in response to the individuals who form it has the advantage of being about real life. Liberals don’t say ‘We know best’, because everyone’s best is different. To be a Liberal Democrat is to be wary of grand plans and little prejudices. To say of human nature, ‘It’s complicated’. Anyone might be kind or selfish, creative or lazy, successful or failing. Other parties see that as a reason to control people, because they believe people who disagree with them can’t be trusted with freedom, and they think ‘their people’ will want to do what they tell them anyway. Other parties fear pluralism, diversity, flexibility and individuality. Liberal Democrats might give an instinctive two-word answer to that ending in “—off”, but we have a better answer, too, countering fear with hope. Our fear is more that if a government makes a mistake in its giant one-life-fits-all authoritarianism, it’s going to be a doozy. And our hope, based on realism, is that the more different ideas run free, the more brilliant, practical ones will succeed. Believe in people, enable people, and unlock everyone’s potential. To be a Liberal Democrat is to embrace the contradictions – because people are contradictory. Because only one idea has room for how messy, contradictory and wonderful real life and real people are. Freedom. I’ve never published this before, but for a couple of years it was on the Liberal Democrat main website as one of nine shortlisted essays chosen in early 2016. 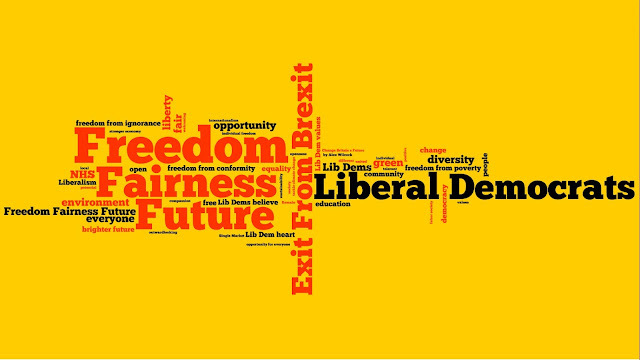 The competition was part of a consultation on “What It Means To Be A Liberal Democrat In 2015”. I re-read it a couple of weeks ago and was surprised how relevant it still seemed (even the ‘traitors’ line was in there back then). I aimed to make our Liberalism instinctive and accessible, and that stands. My video above is much more politically punchy for our immediate priorities and better to show someone who’s not interested in philosophy. Comparing this essay to my 2017 General Election post “A Liberal Britain. A Brighter Future. My Hope”, that takes a very different approach and that, too, has some punchy lines confronting issues I didn’t mention at all here (though in trying to find hope post-Brexit I was a little too shell-shocked to do more than wish it would all go away). You’d think British politics has changed a lot since 2016. As the Prime Minister might say, nothing has changed, and yet everything has. Back when I wrote my “What It Means To Be A Liberal Democrat”, I was concerned that I’d leaned a bit too hard on vigilance about the state rather than its power to help – giving emphasis to education, but not health or infrastructure. After two years of Theresa May in charge, I didn’t go nearly far enough in warning against the might of government to be a heartless bully, an unmitigated f— up, or both at the same time. Back then, Brexit was a looming threat, not yet a tectonic shift. Since then, British politics has been frozen while Britain itself has become far worse – all because of the worst decision ever made in British democracy, and a slither of decisions and non-decisions ever since that have only made the worst decision worse still. In the face of this titanic catastrophe, the Liberal Democrat Leadership has been more frozen than most. Much of the time their only message has been ‘Why can’t we all get along?’ when the answer is ‘Because an awful lot of people made a decision based on hating other people’, and wishing and hoping that they didn’t really mean it and that the clock would turn back has failed to make any impact as a political strategy because it has no political appeal and no political reality. Liberalism is worth fighting for. Bullies must be stood up to. Looking hand-wringingly heavenward and wishing that the bully and the bullied would just get along simply does not cut it. If I’d started writing this today, stopping Brexit would have been the angry focus and I would have been far more pugnacious against Theresa May and her fascistic Hostile Environment or Jeremy Corbyn and his sub-BNP attacks on immigrants stealing British jobs. 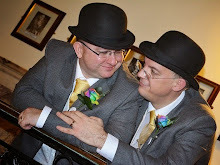 I’ve written quite a few times on what the Lib Dems stand for, and I may well write again. But I realised that what I’d written was something positive – and that wasn’t afraid to take a side. I’ve decided to publish pretty much what I entered, with a couple of small polishes. The competition set a limit of a thousand words. I’ve reintroduced a sentence or two that I’d originally cut for space, but mainly I’ve put back one whole paragraph. The reason I removed that one at the time was that I liked what it was aiming for but it just didn’t quite flow. Ironically, I found the Lib Dems’ “Demand Better” gave me the edge I was looking for, so that one paragraph has been rewritten today and restored to set the tone at the top. You see? You can get something out of demanding better – but you have to give people some idea of what you’re demanding.